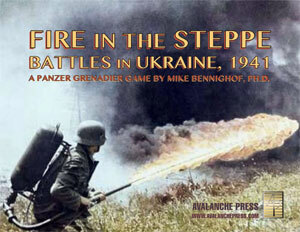 Note: Panzer Grenadier: Fire in the Steppe is based on the tank battles of Brody-Dubno that took place in western Ukraine in June and July 1941. The game tells the story of the through its scenarios and its battle games; today we start a look at the battles and the scenarios. Preparing for Operation Barbarossa, the June 1941 invasion of the Soviet Union, the German Army assembled three army groups in occupied Poland and the German province of East Prussia. Other German and allied troops would attack from Finland and Romania. Army Group South would drive forward to first occupy Lvov, the big west Ukrainian city lying just to the east of the German-Soviet demarcation line, and then on to Kiev and the rich agricultural lands along the river Dnepr. To achieve this, Field Marshal Gerd von Rundstedt led two infantry armies (6th and 17th) and Ewald von Kleist’s First Panzer Group and its five panzer division plus supporting formations. Opposing Rundstedt, Col. Gen. Mikhail Kirponos’ South-West Front initially counted four infantry armies plus six mechanized corps, each of the latter commanding two tank divisions and one motorized infantry division. On paper, Kirponos held enormous advantages: over 3,000 tanks compared to just 800 for Kleist. He had more troops and more artillery plus fortified positions and interior lines. These advantages did not translate to battlefield reality. Many Soviets tanks were not ready for action, needing repairs, fuel or ammunition. Many broke down on their way to combat. Artillery lacked prime movers, ammunition or both. Infantry formations had purposely been held back from their fighting positions on the frontier to avoid provoking hostilities with the Germans. South West Front, under its peacetime designation as the Kiev Military District, had done what it could to prepare for war. When the Germans poured over the borders, its divisions fought back just long enough to allow the mechanized corps to stumble forward into the counter-attacks demanded by pre-war Red Army doctrine. The resulting tank battle of Brody-Dubno (named for the two west Ukrainian towns at the center of the fighting) would be, by some measures, the largest tank battle of World War II and definitely the largest waged up until that moment. It took place in an area annexed by the Soviet Union in late 1939 from Poland; the locals therefore had little love for either of the combatants. Army Group South’s northernmost group of forces came from III Motorized Corps and XXIX Infantry Corps. Eberhard von Mackensen’s “motorized” corps (at this stage, the German Army did not yet use the term “panzer corps”) had two panzer divisions (13th and 14th) with just under 300 tanks between them and a motorized division (25th). For the initial operations he could also draw on two divisions from XXIX Corps, with the Austrian 44th “Hoch und Deutschmeister” Infantry Division tasked with helping make the initial breakthrough to assist the panzers. Neither of the German panzer divisions was considered a first-tier formation; 13th Panzer had been converted from a motorized division and as yet seen no combat in its new guise; 14th Panzer Division had been converted from 4th Infantry Division and undertook limited combat action during the invasion of Yugoslavia in April. Mackensen, the corps commander, was widely considered a legacy appointment riding the coattails of his famous father August. Facing them, the Soviet Fifth Army deployed five rifle divisions in a “checkerboard” pattern of two echelons, leaving wide gaps in the front. Fifth Army’s operations section reported its divisions at an average of 70 percent of personnel strength, spread roughly across the board. Missing enlisted personnel and non-commissioned officers would be made up on mobilization from local recruits, many of them – particularly the vital non-commissioned officers – veterans of the Polish Army and therefore of dubious enthusiasm. These men were to undergo “re-training” at the division depots to confirm their political reliability, but many still had not entered these courses when the war began. Other NCO’s would come from the ranks. Former Polish officers, contaminated with bourgeois ideals, could not be trusted and no plans existed to make use of them (many had indeed been murdered by this time). Instead reservist officers would come from eastern Ukraine, meaning that the war arrived well before these reservists could hope to find their units. The rifle divisions would make up their shortage of trucks, tractors and drivers from collective farms. Collectivization had not yet been fully implemented in this region, and those farms that had been organized did not yet have their full allotments of vehicles. Therefore, like the officers, the trucks and their drivers would also come from the east. And likewise, they never arrived. Nominally attached to Fifth Army, Maj. Gen. Semyon M. Kondrushev’s 22nd Mechanized Corps had nearly all of its enlisted personnel and nominally a few more tanks than called for on its table of organization. But it lacked officers, non-commissioned officers, trucks, prime movers and ammunition. Of its nominal 780 tanks, all but 31 were aged T26 and BT light tanks. The 31 modern tanks, massive KV-2 infantry-support vehicles, had arrived but a week before the Germans attacked. Rounds for their 152mm guns had not yet joined them. Many of those tanks supposedly available were immobile machines used only for training. 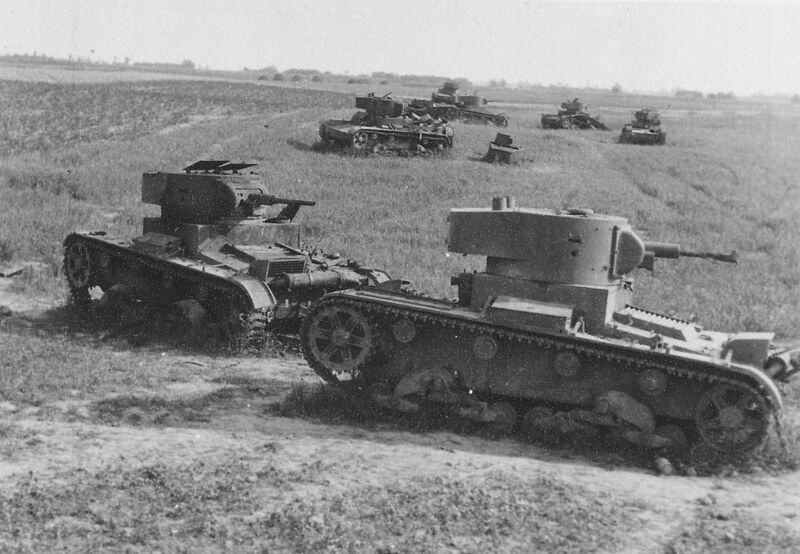 T26 tanks, probably from 41st Tank Division, knocked out on the road to Lutsk. Fifth Army had one important formation the Germans did not expect: the 1st Anti-Tank Brigade, organized in the wake of the fall of France specifically to counter German armored tactics. Maj. Gen. K.S. Moskalenko had specific orders not to allow his unit to be broken up among the rifle divisions; it was to form a stout block against a German advance wherever higher commands felt its presence necessary. Moskalenko, in contrast to other commanders, had everything his table of organization demanded: 48 76.2mm field guns, 72 85mm anti-aircraft guns dedicated to the anti-armor role, sixteen 3mm anti-aircraft guns and a battalion of engineers to help the crews emplace their weapons. Most importantly, the brigade had all of its armor-piercing ammunition on hand and all of the vehicles needed to move its men, munitions and weapons. Twenty-Second Mechanized Corps’ divisions had been stationed close to the frontier; unable to obtain permission from Stavka, the Soviet General Staff, to move more infantry up to the front, Kirponos was reluctant to pull back those formations that were allowed in the vital combat zone. Yet the corps and division command staffs were stationed well behind the lines, with corps headquarters some sixty miles back at Rovno. Adding to Soviet woes, well-coordinated German air attacks devastated communications and targeted transport vehicles, often rendering artillery units immobile even when their guns remained undamaged. German objectives were simple: cross the River Bug, which in this sector served as a moat in front of the Soviet defenses, break through and head for the important road junction of Lutsk with its road and rail crossings of the River Styr. The Soviet imperative was to hold firmly on the “shoulder” of the German breakthrough, to allow time for the mechanized corps to counter-attack the flanks of the advancing Germans.